The Northern Ireland Space Office at Armagh Planetarium has been working closely with the curriculum authorities in the province (Council for Curriculum, Examinations and Assessment, (CCEA)) to create new thematic units for school children at Key Stage 3(11-14). Following a very successful pilot of astronomy and space related material to schools in Northern Ireland in 2007, the ‘Underneath the stars’ and ‘Is there life out there…?’ thematic units have now been embedded into the Key Stage 3 STEM learning process. An important aspect of the revisions to the curriculum was the introduction of holistic learning, attempting to create joined up knowledge gaining experiences across multiple disciplines within and beyond STEM. For example: Using Robotic telescopes and archive data to learn about the lifecycle of stars in science, distance in Maths and colour in Art. This approach was adopted following research carried out by CCEA that highlighted that students were not only turning away from STEM engagement due to the perception that it was difficult but also that they could not relate to the disjointed learning experiences. As part of this process, Hill began work with MacPherson to create Thinking Worlds environments that could help teachers and students engage with specific subject matter in a very visual and stimulating way that pupils could relate to in real life. A typical example of this was to create a three strand environment on Light pollution, causes, environmental and societal consequences, conclusions and remedies. 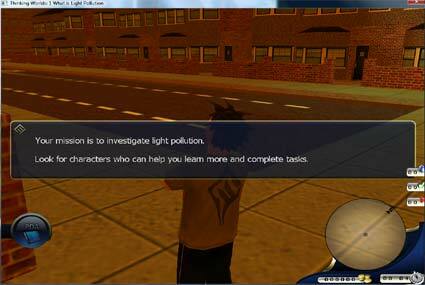 This proved to be very popular among students, especially those that did not traditionally engage strongly in the learning process, with pupils retaining the information, being able to discuss knowledgably about the material within the environment and debate possibilities to implement a light pollution strategy and policy for new housing and businesses in N Ireland. 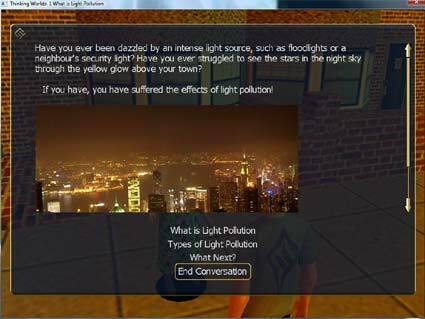 Thinking Worlds (TW) is a unique suite of creative tools, fusing learning behaviours with immersive 3D gaming technology. TW facilitates the publication of engaging learning resources utilising highly interactive and innovative technology. These published resources allow learners to experience and interact with places and people which they would otherwise be unlikely to have the opportunity to visit or meet in reality. 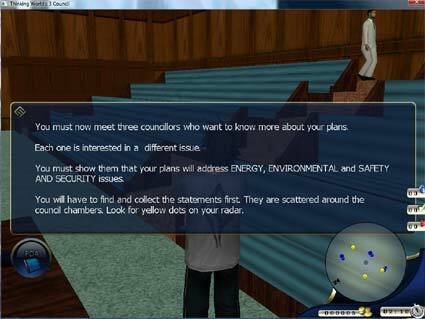 Utilising a wide range of 3D characters and environments, high quality, fully playable 3D learning gaming scenarios can be generated. 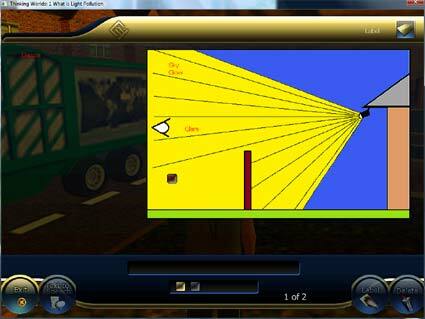 A range of media including images, sound and video can also be incorporated into games. These games can be easily edited, updated or extended and re-published, so users can design their own environments and avatars. 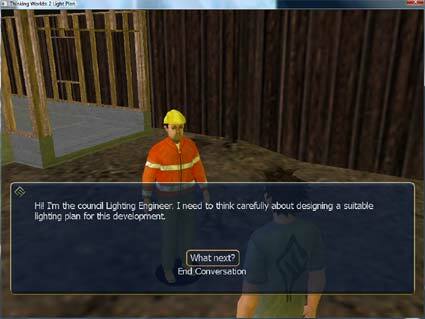 Design a suitable lighting plan for a new development. Having interacted with various avatars and collected information found throughout the interactive environment, labelling diagrams to demonstrate understanding. 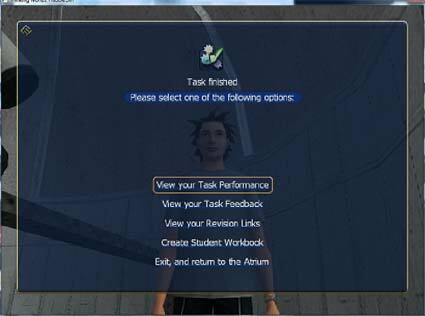 Having completed a task, the user is presented with Task Performance, Feedback, suggested Revision and the opportunity to save a record of their experience in the form of a Student Workbook. TW provide an active but structured learning experience, there are clear goals, offering performance rewards, delivering engaging media and providing instantaneous feedback. While rooted in sound educational principles, it addresses the need to deliver learning to today’s “digital natives” through technology and interactions that are familiar and appealing to them.